The Classictic partner program - Apply now ! We are happy to introduce the Classictic Affiliate Program, which welcomes personal website-owners, bloggers, internet resale shops and content aggregator websites. 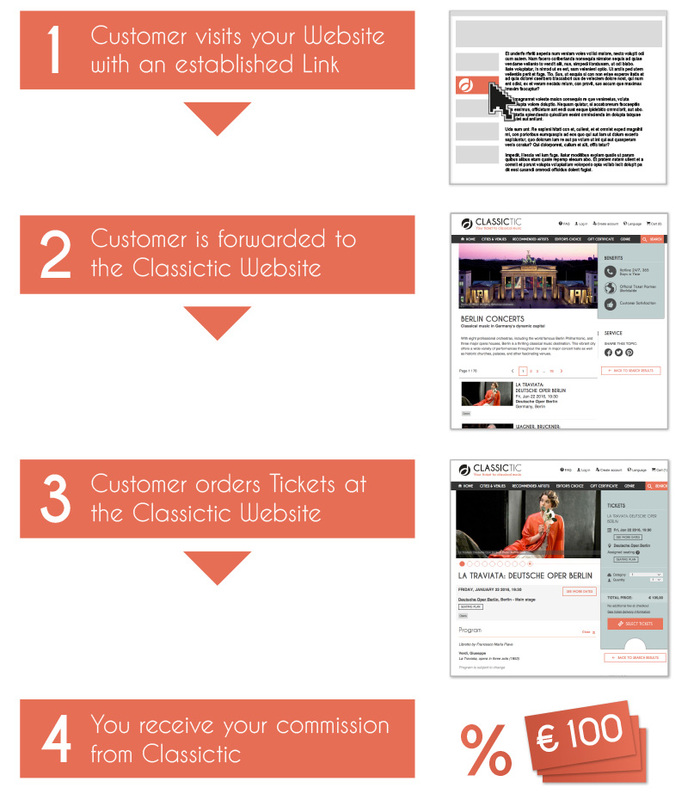 Classictic specialises in the sale of tickets for classical concerts, operas and other music events through the Internet. At Classictic all sales are primary sales. No secondary or re-sale tickets are offered through the portal. Earn money, provide your website viewers with further quality content and give them added service by offering tickets to great performances through Classictic. With our Affiliate Program you present the most well known music institutions to your visitors and readers. Venues such as the Konzerthaus and Philharmonie in Berlin, the Wiener Volksoper and Theatre an der Wien, the Salle Pleyel and Opera de Paris, the Gran Teatro del Liceu and Teatro Real, the Royal Albert and Cadogen Halls in London and several hundred more, along with the top arts organizations that perform in them, can be found on the Classictic portal. - Enhance your product range with tickets for classical events. - Offer an added service to your visitors. - Earn on all ticket bookings made by your forwarded visitors. - Receive payment when credit balance reaches a minimum of 50 Euro. - Track Affiliate session cookies for 30 days with our Classictic AffiliateTracking Code. - Choose among various possibilities for integration. - Implement Classictic contents seamlessly into your own website. - Enjoy support from a dedicated Classictic Affiliate Manager long-term. - View/download traffic reports, settlements, account balances and more in your free Classictic online account. Apply Now! Our Affiliate Managers will gladly support you.